Krzysztof Pruszkowski tells us about the saturation of pictures in the modern world and the short-sightedness they create. A world where pictures are at the same time over-represented and fleeting, very talkative and restrained. Pictures always competing with each other, ending up stacked upon each other and finally dissapearing in the daily stream of information issued by the media. Although the advent of Modern Art was generally considered as being the demise of pictures, there have never been so many since then and this bulimia overwhelmed our “Gutenberg Galaxy”. However, the addition of all these pictures does not formulate or provide more sense to the world. On the contrary, not only do they tend to eliminate each other, but they also seem to create an additional distance, caused by their short-life. Krzysztof Pruszkowski – 18 Samothrace Victories. Louvre.Paris. 1988. By subjecting his photographic topics, wether they are taken from the media or not, to “multiple superimpositions”, Krzysztof Pruszkowski demonstrates the limits of the new reality. A reality which disolves the notion of time picture by picture and, in a way, accounts for the speed which characterizes some videoclips, the instant circulation of information and pictures around the world. We are no more in the order of the snapshot.His process: to subject the picture to up to sixty or seventy superimpositions. He names it “photosynthesis” – the gathering of information which could not be covered in one shot. 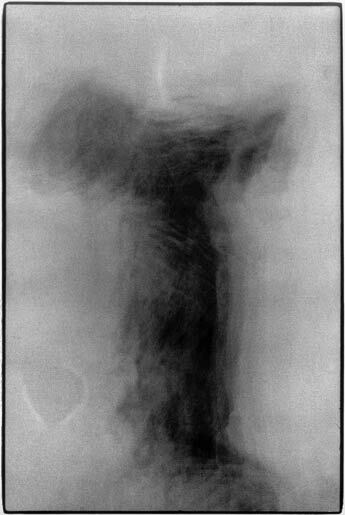 The process is often limited to six or seven superimpositions. The picture doubles, triples, reaches the edge of fuzziness, and provokes a conflict between global and individual, between singular and plural. Therefore, when Krzysztof Pruszkowski addresses one of todays most difficult artistic concepts, which is the portrait, he does not provide a cohesive picture of the model, but rather the search and formulation of an individuality composed by superimposing different faces. For example Jean-Paul Sartre and Simone de Beauvoir (1984), or sometimes more generic, as if he was slowly building up a photofit (portrait-robot), like “Miss Europe” or as with “The President”(1984), with the merged portraits of six American presidents. This is in fact the new representation of the individual within the present social code, commonly named the typical profile for job selection (profil-type des offres d’emploi). The notion of individual has gone from specific to generic, from unique to interchangeable, like the objects which have changed from original to reproduction. A plural vision of a world where “production” is a key word, and where the stock exchange is the new identity, the institution on which everything relies. 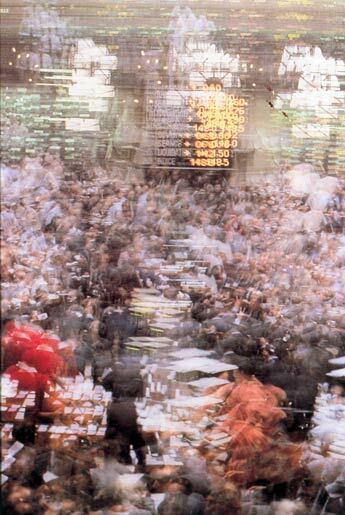 “The Paris Stock Exchange” (1986), this place of urgency par excellence where everything is evaluated, is also probably a metaphor for the circulation of money around todays artwork. The artist does not interpret the world by establishing its apparent form but rather restors its complexity and places it in a context which reveals the richness of its metamorphosis. Krzysztof Pruszkowski was born in Kazimierz nad Wisla (Poland) in 1943. After architecture and town planning studies at the Warsaw Polytechnic University he moves to Paris where he stays until 1988. He continues his studies in Paris at the Ecole des Beaux Arts (Art Academy) and at the Institut de l”Urbanisme (Town Planning Institute). Since 1970 his interest in photography develops, first fashion and publicity, then press photography. In the same time he is looking for his own “visual language” and he publishes a photo book “Barriers” which deals with human mass manipulation within urban space and holds an exhibition at the Paris Centre Pompidou (1978). 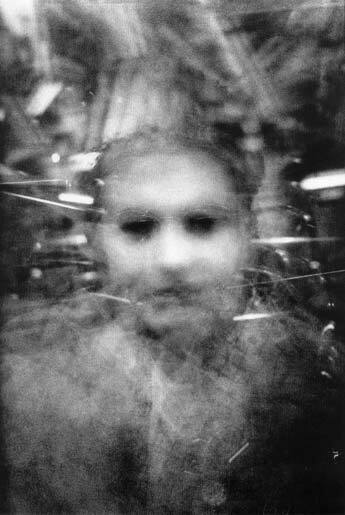 From 1975 Pruszkowski works on developing a new method of photography called “photosynthese”. In 1981 he makes series of reports about the young, independent peasant union “Solidarnosc” which were published in the French daily Liberation. The images were made into posters, drawing attention to occupied Poland under marshal law. Between 1981-1986 he creates his big project about the disappearance of Parisian tramp (clochard) Alexander wich was shown in Poland and France. In 1986 he produces synthesis portraits of 60 first and second class passengers of the Parisian metro in which he brings to attention the class related character of racism. 1988 – the Musee de l’Elysee in Lausanne presents the retrospective exhibition “Monopose – No. Photosynthese – Si” accompanied by the book “Pruszkowski – Photosynthese”. Soon after that he receives the Leonardo de Vinci grant to stay and study in Egypt, granted by the French Ministry of Foreign Affairs. In 1989 he returns to his home town Kazimierz nad Wisla where he publishes his portofolio – A Manifest on Architectural Form: K.M.K. (Konstrukcja Materializacji Konceptu). In 1993 the National Museums of Warsaw and of Wroclaw (Poland) devote themselves to a large Pruszkowski exhibition, where his photsyntheses are exhibited in confrontation with the corresponding objects borrowed from various Egyptian museums. These exhibitions are accompanied by the book “Photology Egypt, Pruszkowski’s Light and Photosynthesis” (Fotologia Egipt – Swiatlo i Fotosynteza, Pruszkowski). In 2000 Pruszkowski receives a grant from the Polish Ministry of Culture. He is currently working on monumental objects relating to historical events. 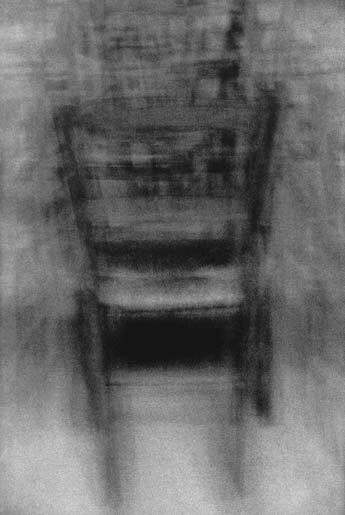 Krzysztof Pruszkowski – 22 chairs. Krzysztof Pruszkowski – La bourse de Paris.